Still no sign of the return to the Commons of the Taxation (Cross-border Trade) Bill and the Trade Bill - two vital Brexit measures that have completed committee stage consideration but are under threat of hostile amendment, when they come back before the whole House. Jeremy Corbyn's speech on Monday has cleared the way for Labour to back Conservative MP Anna Soubry's EU customs union amendment to the Trade Bill - new clause five - which means it could very well be passed. In the Commons as in the Lords, the government is only in danger of defeat if Labour pitches in with Tory rebels. 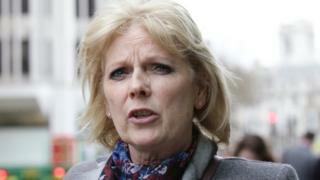 I'm told no decision has been taken for Labour to support the Soubry amendment, but it is doubtless a serious temptation, because passing it would cause huge problems for Theresa May. Here's the amendment in two deadly lines: "It shall be the objective of an appropriate authority to take all necessary steps to implement an international trade agreement which enables the UK to participate after exit day in a customs union with the EU." It would commit the government to a policy Theresa May has rejected and one which would split her government. So the bills are being held in limbo, while government whips try to find a compromise that would satisfy Conservative rebels, without infuriating Brexiteers. Which may not be possible. The Brexiteer line is already clear - staying in a customs union would be a betrayal of the referendum vote because it would leave Britain as an EU "rule-taker" and foreclose the possibility of lucrative international trade deals across the globe. The Remainer line is that a failure to agree "a" customs union would have a devastating impact on British industry. In short this is a crunch point, and one which the government is keen to postpone. Through a rather unexpected route, a second front may be about to open. Some rather arcane reshuffling of who controls what backbench debating time in the Commons has given the Liaison Committee (the super-committee of select committee chairs) the opportunity to put down vote-able motions of their own. The first motion they will propose, when they get a debating slot, will be on.... drum-roll.... the customs union. It is a moot point whether such a vote would be binding on the government. But potentially it would provide a serious test of Commons opinion. What the Remain side hopes is that it would force the Prime Minister to face down what they call her "hard Brexit" wing, and take on board a commitment to "a" customs union. She would be able to tell them that they could not get a Brexit without a customs union through the Commons so they would just have to lump it. They believe this cause would bring out all the "submarine Remainers" who they believe have been biding their time and waiting for the moment to strike. It might even induce a number of ministers to surface and hoist the Jolly Roger - or possibly the EU flag - even if it meant resignation. It is hard to see the Brexiteers accepting this without a fight. There would undoubtedly be a huge row and even cabinet resignations and that could quite possibly spell the end of Theresa May's premiership. John Major's helpful (sic) suggestion of a free vote on these issues in the Commons would not defuse the threat - just free up Remainer ministers. Whipped or not, the divisions among Conservative MPs will not disappear. Meanwhile their Lordships will be trying to create more divisive votes to test the Tory whips and the consciences of pro-EU Conservatives. When, at some point after Easter, the EU Withdrawal Bill enters its report stage, the aim of Labour and the other Opposition parties, and of many on the crossbenches, will be to attach as many amendments as possible, ultimately forcing the government to whip Conservative MPs to overturn them, when the bill is sent back to the Commons. Some amendments may be swallowed by ministers, even if they have to gulp pretty hard. Would they die in a ditch to keep the UK out of the atomic energy agency, Euratom, or the student exchange programme, Erasmus? But on the bigger issues, they cannot easily swallow amendments which require the UK to stay in "the" or "a" customs union, still less amendments which mandate a further referendum.